Intended use: All runs except in bad weather. Upper: Closed mesh, stretch mesh, synthetic leather. 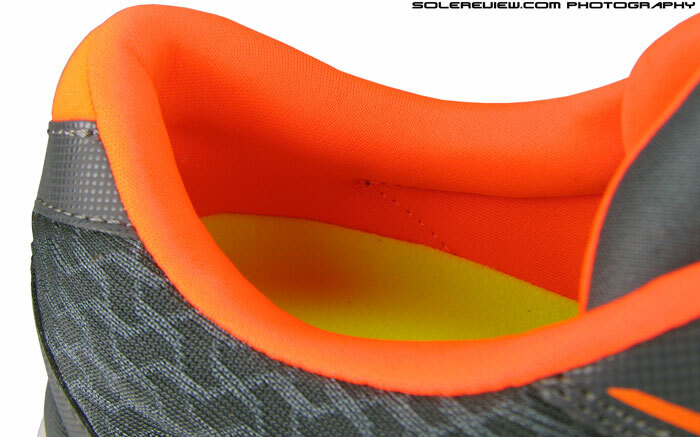 Midsole: Dual density, injection molded EVA foam. 4 mm heel drop without insole, and 8mm with. Outsole: Injection molded EVA foam. Comes with a dual density midsole and aggressive outole lug design, making the ride much more responsive and cushioned than other GoRun models. Upper fit is good - only if you use the optional insole provided. The GoRun Ultra is intended to be cushiest of all Skechers, with its dual density midsole set-up. Within the Skechers universe, the GoRun Ultra happens to be one of four performance running staples, the other three being the GoRun Ride 3, GoRun 3 and GoMeb Speed 2. The Ultra is positioned as a GoRun with maximum cushioning, also offering a level of terrain versatility missing in rest of the GoRun models. If you’re coming off fresh reading our GoRun Ride 3 review, then some parts of this review will be a Deja Vu of sorts, as we run through similar design elements on the Ultra. At the same time, there are features which separate Ultra from the pack, which in turn influences how it behaves under usage. The grey foam is softer than the firmer base it lays stacked on. Key area of difference lies in how the Ultra’s sole unit is constructed. 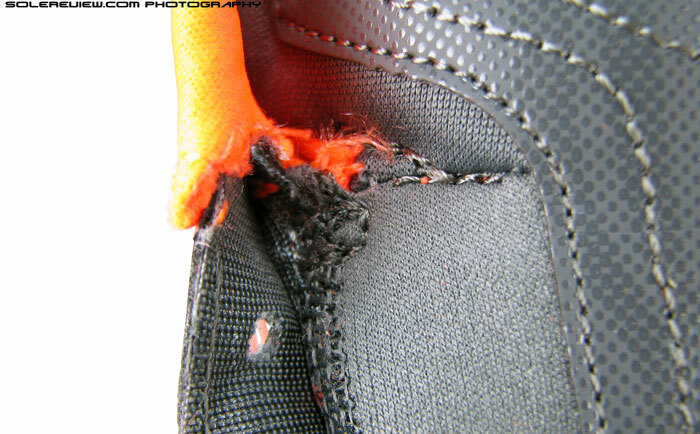 Instead of having a single density EVA midsole, the GRU has two layers of foam stacked over one another. On top lies softer foam (Resalyte), and lower midsole is another layer of foam – much firmer and also forming the outsole. 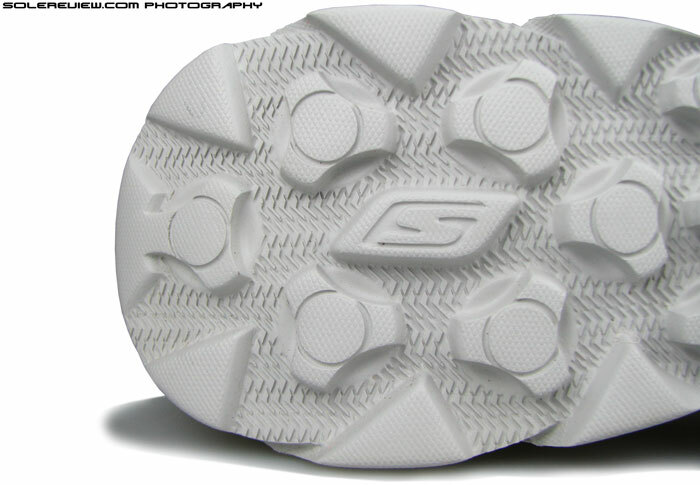 There is no rubber at all on the Ultra, leaving all traction duties to the foam which Skechers calls Resagrip. The lug design is also very aggressive, making it suitable for both urban and non-technical trail running. We’ve noticed that Ultra’s foam outsole fares much better on durability than the softer foam based GoRuns; the harder compound is more capable of taking abuse. Also have to consider the fact that the lugs are much smaller and well spread across in a full-contact configuration, as opposed to having partially recessed pillars (GRR 3) – this distributes wear and tear more evenly. The GoRun Ultra has a responsive ride when placed next to other models in the line. Better served with the optional insole – they come packaged with the shoe. 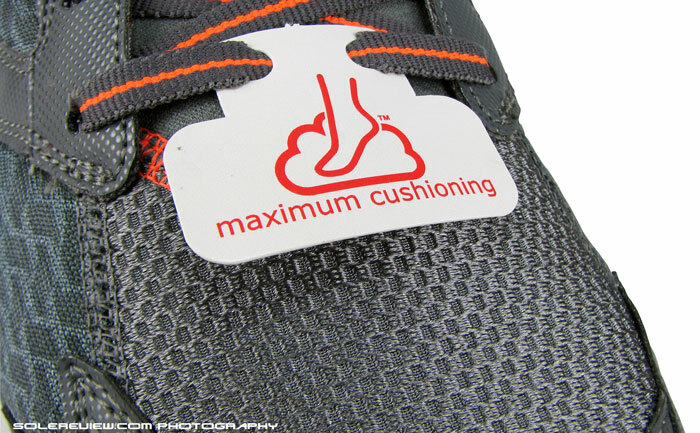 As a consequence, cushioning is far more responsive than softer foam based Skechers. Even without using the removable insole, the combination of soft and firm midsole foam add levels of springback. 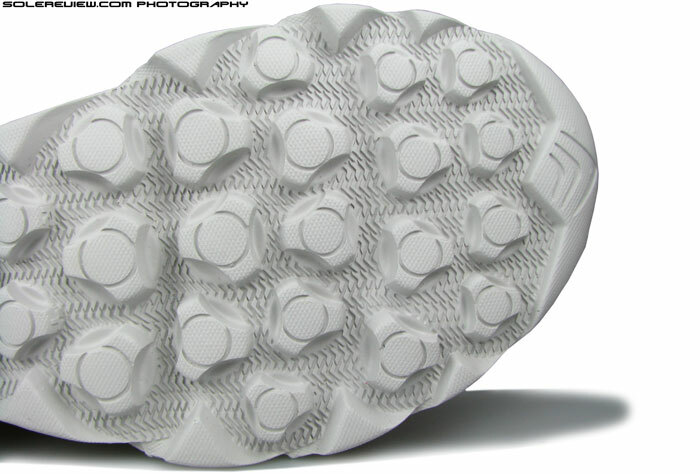 There’s some help from the longer lug length of firm Resagrip outsole, with each of the Golf Spike-shaped pillars acting as independent foam pistons. Pop the insole in, and it further enhances levels of responsiveness. 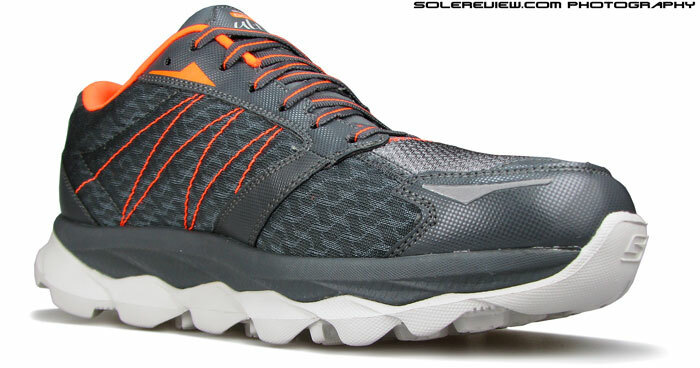 The flip side is that the Ultra lacks the easygoing nature of Skechers’ next-in-line cushioned model, the GR Ride 3. This means walking around or doing slow runs in the Ultra will not feel as padded as the Ride 3. The Skechers GoRun Ultra feels best for longer run durations, and at medium to fast running speeds. Impacts are absorbed effectively, and the midsole construction’s responsive nature makes it a better candidate for tempo workouts. Full contact angular forefoot lugs. There’s a deep flex groove under the metatarsals, which makes flexing a bit of a workout. The heel is curved prominently upwards, part of Skechers ‘M-strike’ design. Forefoot is stable, as a number of full ground contact lugs spread weight and grip over a wider area underneath. That said, forefoot transition turns out to be bit of a foot workout. The Ultra has these very deep flex grooves just under the metatarsals, so while flexibility is good, it feels that the foot has to work hard to stretch the midsole material, instead of just rolling over towards toe-off. 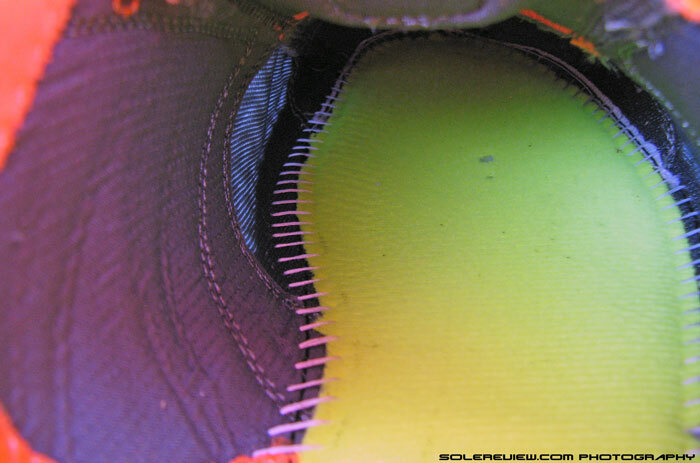 Heel section has Skechers’ trademark ‘Mstrike’ design, visually characterized by the heel section curving upwards, made with the purpose of shifting foot strike position forward. As pointed out in our GoRun Ride 3 review, this feature is capable of inducing a rear-foot strike instead of an acute heel strike, but nowhere near late-stage rear foot strike or forefoot strike – something which Skechers refers to mid-foot strike. We’re firm believers of the thinking that a major change in footstrike behavior is possible only with active involvement of the runner, and not by change of footwear alone. Unless you’re sprinting in a pair of track-spikes – which is a different set of conditions altogether. There’s a lack of stability at walking and lower running speeds due to the midsole bevel. The heel rests on the last pair of lugs, which causes a rocker motion. Heel stability isn’t the best on the GoRun Ultra, especially at standstill and easygoing speeds. The sharp upwards heel flare results in a rocker sensation, where you feel the lack of support around the rear extremities. The GRR 3 also has a similar design, except that the lug design underneath is much more rounded and spread out – resulting in greater surface area. In contrast, heel loading on the Ultra tends to hinge on smaller, firmer lugs separated by deeper grooving. This creates a feel of sharper ‘hang’ and rear biased tilting. This isn’t so much of an issue once you pick up pace, and obviously will be of no consequence if you’re a forefoot striker. Backwards tilt and forefoot flexion aside, heel to toe transition is good, as multiple lugs help carry weight forward. Arch support is good if not great, as the midsole is filled up nicely underneath – no poking or pressure on the PF. Upper lining is un-foamed and the padded Strobel is stitched to upper traditionally. Lacks the aesthetic finesse of the GoRun Ride 3 in that department. Compared to GoRun Ride 3, the other cushioned alternative, the upper fit feels more business like and focussed with the optional insole laid inside. 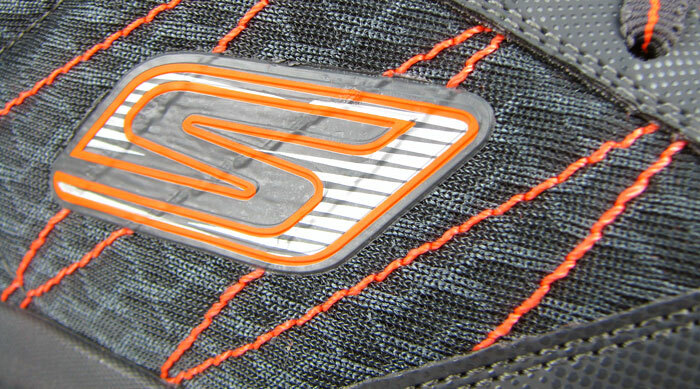 The upper lining isn’t foam lined like the Ride 3, instead using a flat structured mesh. The midfoot panels are quilt stitched, making the shoe feel more ‘packed’ feel in which the materials feel closer to the foot. The front section of tongue is without padding, and the stretchy Spandex like fabric snaps snugly over the foot. 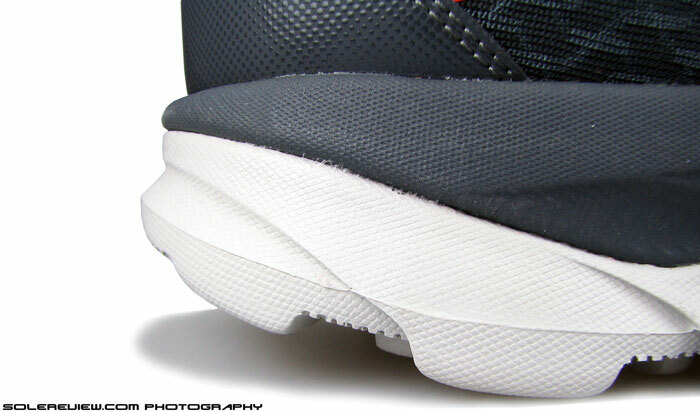 Forefoot fit on either sides is more or less like the GRR 3, but the toe box is shallow – not because the last has changed, but of the way how the synthetic leather bumper is placed. The piece of synthetic at the tip is shorter in height, joining the mesh at a shallower point over the big toe. So it’s likely you’ll notice a greater degree of toe poke relative to the Ride 3. Midfoot fit is snug, as the Ultra makes use of a sleeved upper to wrap around the foot. This has the tongue stay put in its place, no slide here like the un-sleeved variants. The tongue fit stays optimum regardless of the fact you use the insoles or not. There was some feedback on the internet that the tongue tends to bunch up in absence of the insole, but we experienced no such thing. Collar is built up, with the Ultra preferring to use an internal heel counter like a traditional running shoe. Not that it affects the heel grip much; that is left to the collar, which offers good grip around the foot with the insole inserted. Take out the insole, and there a sense of slack around the ankles. As was our experience with the GoRun Ride 3, the shoe upper feels best with the insoles, with the overall fit and feel coming through as far more optimized. Reflectivity is used sparingly but is placed in important areas. There’re a couple of bits upfront, and the heel screen print is shine in dark type. 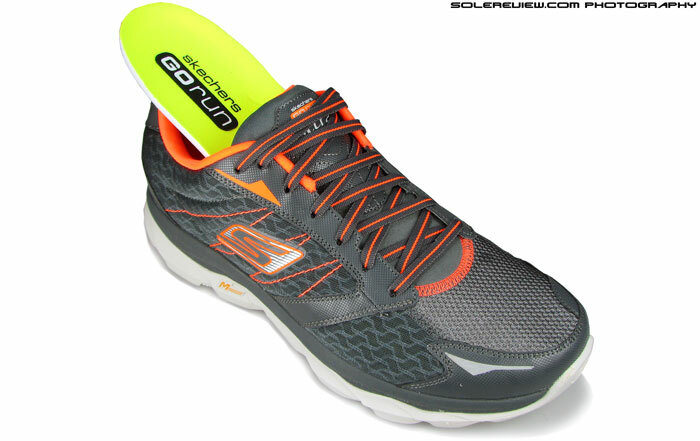 Overall, the Skechers GoRun Ultra is great value. At $80, it combines a sub 10 Oz weight with a satisfactory upper fit and responsive cushioning. We’d love to compare the Ultra with the Hoka’s but guess we’ll have to wait till mid October for that. Note on ratings: Our numeric scoring of 8.1/10 is based on a total of weighted averages. The attributes namely transition, stability and fit contribute to 69% of total scoring weight, which we see as more important than material (7%), cushioning (7%), traction (12%) and weight (5%). Hence the scores will not add up when a method of simple average calculation is used. 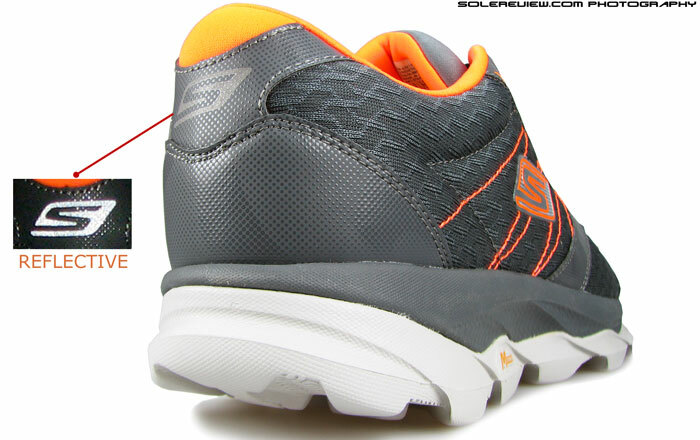 Also note that the ratings is based on using the Skechers GoRun Ultra with the removable insole. We felt that provided a better experience than without it, and hence formed the basis for our score. I really enjoy your reviews–by far the best on the internet–and like the selection of some relatively lesser known shoes. With the recent trend toward maximalism we have also seen sub 10 oz shoes like this one with huge cushioning. Are shoes that still push the 13 ounce range (e.g. the gel systems in the nimbus, et. al) really offering anything that the newly light maximal shoes don’t have in terms of responsiveness and cushioning? Should heavy shoes be going the way of the dinosaur? Keep up the great work (and photos). Thanks for the review. I have been running in the Ultra’s for about 200 miles and must say that I really like the soft ride. I do run mostly on the road and so they are wearing quite quickly, but I think Skechers is on to something. I find the fit to be true to size or a little large. The toe box is great and strangely enough, the laces are the best I have run across as I NEVER have to double knot them and they have NEVER come loose. On the down side, they wear too quickly, I don’t like the tongue sewed down on both sides and they could use a little more side control. For the long, slow runs, I think this is a really good shoe. Thanks for the insights! The laces are elastic (slightly) so perhaps that helps keep them knotted. Agreed, the tongue could have been an elastic gusset for better fit. I was going to ask about the wear because that seems to have been a common complaint among users but you seemed to think it was pretty good, unlike on the GRR3s (don’t have these but the wear on my GRR1/GRR2 has been ok). Also I’d mentioned that the drop felt huge when I tried on the Ultras and this seems to be confirmed by Fellrnr’s review here http://fellrnr.com/wiki/Skechers_GOrun_Ultra where he gets 10 or 14mm without/with sole – apparently he sliced the shoe! Durability level on the Ultra is better compared to, but relative to the wear and tear on GRRs. At the same time, the EVA based O/S will score lower than traditional rubber based soles. We saw Fellrnr’s review several months ago, he’s done a great job with slicing all those shoes up and laying them out! You have the best review site for shoes. Iiked it very much. Specially the details review from each perspective. Was searching for sketchers go ride ultra review before buying it and now I am convinced after reading this review. Thank you for the comment Ashok, happy to hear our reviews can help with your purchase decision. Do let us know if you have any questions! Hi! I’m planning on buying these shoes cause they have lot of cushioning which I LOVE (besides the price), but I have a question. I know they are running shoes, but I plan on wearing them not really primarily for that purpose, but for walking and the gym (where I do plenty of training in different things, which include lots of jumping, that’s when I love highly cushioned shoes more). I have several Skechers sneakers and they fit me perfect, that’s why I want these pair of Ultra. You are the expert, do you think they will be appropriate for what I want them? Thanks so much for your time!! Hi there! Which Skechers do you have currently? Also from the performance division (but more cross trainers than anything else): many Skechers Agility (in different models and colors), Skechers Flex Fit, Skechers Sinergy. My all-time favorte, however, were the Shape-Ups (I still have 2 pairs that have survived the pass of time), but unfortunately they no longer exist. These ULTRA seem to me kind of similar, though they are for running purposes. My concern is that the outsole is not going to be durable maybe… especially since I regulary walk (not run) 20KM from town to town. What do you think? Frankly, we have no idea how the Ultra will compare to the shoes you’ve mentioned – since most of them are Women’s training shoes. Assume that they are slightly lower to the ground and fit differently too. The durability of the soles on the Ultras are HORRAWFUL. Pathetic. I have a couple of them, and after 3 miles you see wear. My lugs in some parts are COMPLETELY worn away. I told Skechers I’ll NEVER buy another until this is fix. Thanks for the feedback. We did mention that durability was relative to the Ride 3! I picked up a pair of the Ultra 2’s this weekend at the RnR New Orleans Marathon expo. They were offering a 20% discount so I bit. After wearing them around the rest of the day, decided to run the race yesterday in them. I was very surprised with how much I liked them. They were a great compromise between the Hoka Bondis and Asics Kayanos I’ve been wearing. Even though they are 4 mm drop, they really felt like more (which I like) because of the very supportive midfoot feel. And for those worried about durability… Every pair of Bondi 2 and Bondi 3’s I’ve own have shown more wear after 5 miles than these did after a marathon. So…it’s all relative in the “maximalist” world. Thanks for the feedback. Hokas aren’t the exactly the torchbearers of material quality. They ride great, but many other things on them need improvement. Having tested the GRR3/4, GR4 and GoMeb 3, we also find the Ultra to hold its own in ride behavior. My Ultras have roughly 250 miles on the clock and although I´m wearing down the rubber on the lateral forefoot, the ride and cushioning are holding up pretty good. Really nice and well priced shoes. Hoping to get 400-500 miles out of them. I am a passionate runner for about three years now and I want to confess here in SoleReview my inner thoughts about the Skechers GOrun Ultra I. First, i must admit that SoleReview-ers has passion with their work and it shows!!! First I must say that I started running with some early Adidas running shoes in the mid category. One day I went to a local Outlet and I saw this unknown firm called Skechers ( Unfortunately here in Greece, Thessaloniki city, Skechers is absent. And ai mean totally absent. I didn’t know what to expect so I bounty them for a very cheap price. I was so in love with the feeling of the shoe that I soon forgot my others running shoes. Completely. With the Ride I i run carefree, almost barefoot in a sense but enough cushioned also. Next, there was the GOrun Ride 3. I bought them from EBay, they came. Instant love again. Light, very flexible, very cushioned. A dream to say the least at that time. Some initial feeling of worst air ventilation in comparison with the ‘spartan’ Ride I was quickly away. Every run was a joy. At that time I tried to see if there is other brand that can give me so much joy and freedom. So, i bought the Adidas Glide Boost at the price of 139 Eur!!! I wore them for about 150 km. Did a half marathon etc. No comparison with the Skechers, and if compared with my Ultras the Boost material doesn’t take a stand near the cushioned sole of the Ultra. Adidas GB felt very stiff on my feet, really discomfort ness and luck of ventilation. The sole had a strange hard feeling especially on the forgot area. I was really upset that days. Moreover the toebox was squeezing my fingers. Rally sad. Luckily I sold them. Finally, for this review of mine which is somewhat my whole running story (sorry for that,!) I bought my pair of Gorun Ultra as my brother went to the U.S.A. and brought them for me. In red colour, they were extraordinary! Since I had previous models of the GOrun family I realized some differences among them. First, Ultras are by far the best cushioned running shoes I Have worn in my life. The feeling when running is awesome. Even the Adidas Boost material cannot match this feeling. Ultra is best when running rather long distances. At that distances the shows open their magic to the feet. I wouldn’t recommend them for daily walking use our at the office as these shoes has tall sole which in walking makes you feel a little quirky. They are nice in walking and you feel the cushion right away. But as i said use them in running. There will give you their awesomeness. On the road or on a trail they are perfect. Their size now must say that are true to the normal sizes. There is plenty of true room for your fingers, wide and tall toebox and the size is exactly of what you are usually wearing. I wear 11.5 US. Imagine that Adidas GB, as also Nike Zoom Pegasus 30, 31, Structure 18 that i later bought and of course returned right away, due to their narrow and stiff toebox had me wear half size up. And again my feet in them were trapped and miserable like suffocated. I don’t understand why Nike, Adidas etc doesn’t give more space to the toebox. Anyway. So, Ultra is really nice on the road, no knee pains, no nothing. Ventilation is ok, but less than the spartan gorun Ride I. Ride3 is close to that with the Ultras. The weight of Ultra is surprisingly very low in comparison to other cushioned and trail shoes. The structure of Ultra is more firm especially at the heel which is good. When you tie your shoes more you get note stability that way too. So, the shoe is really light and that is very surprising. Tongue is not an issue, material of the upper could be better though. Maybe a little more breathable but is ok.
About the durability of the outsole i have read a lot of opinions that is not suitable. Maybe that is the case for me too but in a good way. I don’t want to have a sole for five years e.g. and the material to get hard dry and all the cushioning to be a thing of the past. We must for that reason buy shoes that are light, flexible, and have cushioning technology in a good price. Therefore we must first protect our feet and health and then our wallet. For the durability I must say that I have already done 300+ km with them and the feeling of joy and cushion is there like the first day! No apparent wear on the outsole except on the outside of my heels as I overpronate in both my legs! Lol! For the history, I bought also the GOrun Ride 4. I use them also for small distances and they are great too. They are more firmer than the Ride 3 but the outsole feels the same. Also they are a little more breathable than the Ride 3. I think I said TOO much today but it was because of my love to this brand which gave me freedom and joy. I believe that if someone will wear a GOrun shoe, then in my opinion will never wear another brand. And that’s because of the freedom and joy that these shoes give. Thank you for your time for listening. That is one detailed feedback, thank you so much! Happy to hear that the GR Ultra is working out so well for you – have you tried the latest Skechers GoRun Ultra Road? We’ll be reviewing that in a month’s time or so. I just wanted to say that I’ve spent the last 5 months learning to run in a “natural” form, I was a terrible heal striker. I bought some of these on a whim for my longer runs on clearance for $50 in that lovely brown color (LOL). I’ve put nearly 200 miles on them and my soles show nearly no wear, even still have the fine texture on all but one lug. I’m sure if I still ran on my heels the heels would be smooth. They felt odd at first as I’d been learning with more minimal shoes on but soon fell in love with them. Hope I can find the road version in Canada. Thank you for the detailed feedback! $50 is a great deal; hope we do get to review the recent Go Run Ultra road version soon.